Fitbit today unveiled its new Charge 3 unit, adding a premium swimproof design and a seven-day battery, among other features. 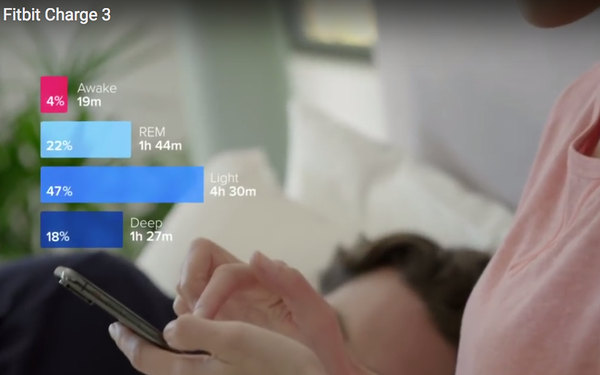 Separately the company touted an upcoming app called Sleep Score for Fitbit units that helps users understand the quality of their sleep and watch for developing issues, like sleep apnea. The Charge 3 retails for $149.95, and include features previously only on Fitbit’s more expensive Versa and Ionic models. For an extra $20, Charge 3 customers can also have Fitbit Pay, which allows a user to literally tap into pay partners. Also coming soon to the Charge 3 are health-tracking features that will allow women to “gain a deeper understanding” of their menstrual cycle by logging the timing of their period and ovulation, and compare symptoms and cycles over time. “Charge 3 gives existing users a compelling reason to upgrade, while also allowing us to reach new users who want a sleeker, more affordable wearable in a tracker form factor,” James Park, co-founder and CEO of Fitbit, said in a statement. That remark underscores the tricky smartwatch and fitness tracker markets. For many consumers, trackers sometimes seem too clunky and jock-oriented. And for some, smartwatches seem too app-laden and slick. Both markets seem to be working toward the middle. Market research firm IDC noted in June that Fitbit had a difficult first quarter and that its market share dropped to 8.7% compared to 12.2% last year. It is still the world’s third largest manufacturer of wearables, behind Apple and Xiaomi, according to IDC, which was generally upbeat in its outlook on Fitbit going forward.